We proudly welcomed Ryder Andrew at 12:13 PM on December 18. Rye clocked in at 7 lbs 11 oz, 23 inches. The best belated birthday present, ever. My oven is spectacular; we did have to go in and get him. He’s a healthy baby hippo with massive hands and feet. We are still figuring out parenthood but every day we look at him, look at each other, and can’t believe it. The biggest surprise about being a mom is how calm it has made me. I am typically the frantic one, but I welcome the middle of the night wake-ups and there is nothing better in this entire world than having a naked baby on your chest. I feel a bit more gentle and your motherly instincts really do kick right in. Forget making a schedule and forget making plans, there is one person around here who makes all the rules. I’ve been slowly but surely getting back to routine, and getting Ryder out on walks and showing him some of our favorite spots around town is important to us. I feel so lucky to have been able to experience this miracle and are forever grateful for the opportunity to be the parents of this little munchkin. Ryder is healthy and full of life. Thank you all for your support and well wishes. I wish you and yours many blessings over the holidays and in 2013! And now, a montage of baby madness! He is absolutely beautiful..absolutely precious.My heart is melting!! You look so gorgeous and happy. What a blessing. You have such a beautiful family. Ahh, I’m soooo happy to hear this. Thanks for sharing the pictures. Ahhh CONGRATS friend! What a beautiful baby boy! You are glowing in all the pics!! Have a fabulous weekend! Oh my goodness!! Look how beautiful you and Mr. Ryder are!!! Congratulations to you and Andrew- Ryder looks absolutely perfect. Are the pup and him best buddies already? P.S. Is it weird/creepy that I came back to look at the photos again and teared up?! I’m so happy for you guys! Congrats, my love! He is perfect! Enjoy the rest of the holidays with the new family!! Thanks, Amy! Happy new year to you too, sweets! Thanks, K! I could eat him up! Oh my goodness! You guys are beautifully blessed. Congratulations! Thank you!! We are beyond lucky. Congrats to all of you!!! Are you sure you just had a baby though, you look fab! Congrats! That is so great! Looks like a little triathlete to me. The hus is grooming him for just that, haha. And didn’t know about Brad Pitt, that’s awesome!! so excited for you! he’s precious, but then again, i knew he would be. Hugs! Thanks, Linds. We are already wrapped around his itty bitty finger. I know!! Can you believe it?! Day after mine, go figure. Can’t wait to see your munchkin in the new year. Happy 2013! What a beautiful family!! Congratulations!! awww HE IS A BEAUTIFUL BABY!!! I love his name! you look gorgeous!!!! I hope you’re having a wonderful time learning all about your new best friend! Thank YOU for all your advice and well wishes:) Means so much. Thank you!! Hope you had a great holiday. I am in with your little family. You three are so gorgeous!! SO happy for you. 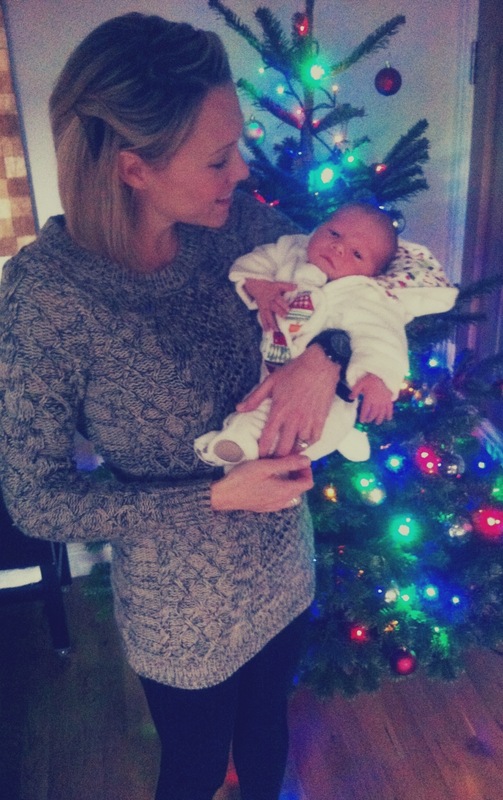 What a beautiful Christmas and way to ring in the new year with a healthy baby! CONGRATS LOVE! Bah!! Thank you for a lovely message:) I’ll be living vicariously through your amazefest NYE! CONGRATS!!! oh my goodness, he is so flipping adorable and you are just about the cutest mommy-to-be/now-is! wishing you all of my best! Thank you SO much for the lovely message:) We are thrilled. awww!! congratulations!!! what a gorgeous little boy! I LOVE the montage of pictures! you look gloriously happy and gorgeous!!! So so happy for you! Thank you! My iPhone is flooded:) Happy New Year – 2013 is going to be amazefest for you! OMG YAY!!! He is PERFECT!! I Loooooove that name too!! And mama? You are GORGEOUS!!!!! SO SO SO happy for you!!!! Ah, bless you! Thank you for these amazing, kind words:) I could use your barre training now, please! Oh my! MY OH MY….what a perfect, beautiful gift for you this Christmas! Congrats to you. I can see in your photos (that are oozing with LOVE!) that you make a wonderful mother. Wishing you all the best friend! Beautiful baby. Beautiful mama. & Beautiful post! I love this. Congrats to you and your happy family! Really fun to read along on your pregnancy journey, as I am just starting mine (12.5 weeks, but have not revealed this on my blog yet, as I have not yet told my office. Soon Soon). So motivational seeing that you really stuck with your workouts the entire way through! Congrats on everything, especially the baby boy!